PITTSBURGH -- From his couch in South Florida, Le'Veon Bell watched the Pittsburgh Steelers stumble to a 1-2-1 start, watched the running game stall and felt a gravitational pull to return. "I feel I can be the missing piece," Bell told ESPN on Oct. 1, the day after the Steelers rushed for 19 yards in a 26-14 loss to the Baltimore Ravens. Bell privately eyed a return before the Week 8 matchup with the Cleveland Browns, a few weeks earlier than his original plan. But a story with seemingly endless twists and turns started to get re-tangled. Bell told at least one person in his circle he was concerned about a trade, prompting him to stay away beyond the Oct. 30 trade deadline. The Philadelphia Eagles were among the teams he believed were interested in moving on him, and a trade would complicate his free-agency plans. Steelers running back James Conner went on a rampage starting in Week 5. Still, Bell worked his normal training routine in the weeks before leaving Miami, and his return to Pittsburgh last week prompted optimism. But then, as of Saturday night, Bell was unlikely to show at the team facility by the 4 p.m. ET Tuesday deadline to play at all this season, according to ESPN NFL Insider Adam Schefter. Tuesday was the moment of truth, and Bell stayed away, leaving $14.5 million on the table this season. After two years of rocky negotiations, cryptic messages and salty teammates, nothing surprises anymore. 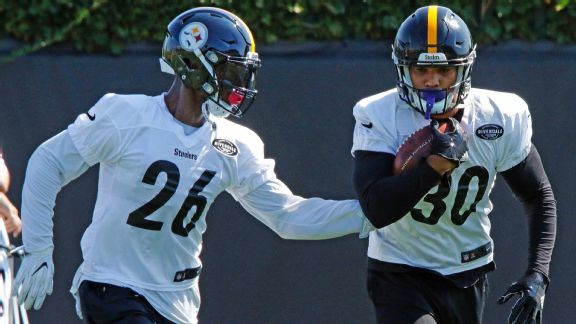 June 2016: With a second drug suspension looming, Bell tells reporters he's not negotiating with the Steelers, setting the stage for him to play out the final year of his rookie deal. Bell's off-field issues prevent both sides from finding a pre-free-agency agreement that would have avoided Tuesday's mess. "We haven't had that discussion yet, so I'm gonna let that thing take care of itself and see where it goes from there," Bell says. July 2016: Under the alias "Juice," a nickname given by coach Mike Tomlin, Bell releases the rap song "Focus," which revealed his self-worth on the field. "I’m at the top, and if not, I’m the closest. I’m a need 15 a year and they know this," he rapped, hinting at a $15 million salary. Aug. 21, 2016: During the week the NFL hits him with a three-game suspension, Bell comes clean. "I already apologized to my teammates, my coaches and Steeler Nation," Bell says. "I'm sincerely sorry about everything I put everybody through. It's been frustrating, and I own up to everything. It's all my fault, and I can't blame nobody else for that." Any last hopes for a contract discussion are dashed at this point. Dec. 28, 2016: Accepting the team MVP award for his historic production in 2016, averaging 157 yards per game, Bell tells reporters about his contract: "Obviously, I want to be a Pittsburgh Steeler so obviously we’re going to try to do everything it takes to make that happen." Quarterback Ben Roethlisberger says the team should do whatever it can to keep him. Feb. 27, 2017: The Steelers place the first franchise tag on Bell, stressing that they hope it can help Bell retire a Steeler with a long-term deal. The tag is worth $12.12 million. May 23, 2017: Bell fails to show up for organized team activities, making it known he's not happy to be tagged. Bell was recovering from a knee injury and couldn't practice yet, but his absence speaks loudly. "I’m not worried about the chemistry, but I wish he’d be here just because he’s one of the pieces to our puzzle," Roethlisberger says. "I know he can’t participate because I don’t think he’s 100 percent healthy, but it would be nice to see him here just in terms of the chemistry and learning and being a part of this process. But obviously, it’s up to him." July 17, 2017: The franchise-tag deadline passes without a deal, and Bell tells ESPN both sides were not particularly close, while setting a tone for the future. "I feel I should be valued as a player, not so much my position," Bell says. "Hopefully down the line I can get valued at, not as much a guy who gets the ball 30 carries and that's it ... I make plays in the passing game, blocking, doing everything. I’m arguably the top running back in the NFL and the No. 2 receiver on the Steelers, even though I play running back. Their career receiving total vs. mine, they don’t have more yards than me." Sept. 4, 2017: After missing training camp, Bell ends his holdout and returns to the Steelers for his first practice, the Monday of Week 1. Addressing reporters at his locker, Bell says he plans to show the team he can play an injury-free season; Bell had concluded each of the previous three with an injury. Healthy and back in the lineup, the franchise-tag discussion goes dormant for a while. Oct. 9, 2017: After 15 carries for 47 yards in a 30-9 loss to the Jaguars, Bell calls sticking with the run a "formula for winning." The message: Run the ball more. The next week, Bell posts 179 yards on 32 carries in Kansas City. Jan. 12, 2018: Bell drops big news in an interview with ESPN, claiming he'd sit out the 2018 season or even retire if the Steelers place the franchise tag on him for the second consecutive year. "Just get the numbers straight, exactly where we want them. I'm not going to settle for anything," Bell says the Thursday of the week of the divisional playoff against Jacksonville. "I know what I do and what I bring to the table. I'm not going out here getting the ball 400 times if I'm not getting what I feel I'm valued at." This serves as foreshadowing for the lengthy 2018 holdout. Jan. 24, 2018: Bell speaks with optimism from the Pro Bowl, teasing a long-term deal. "We are a lot closer than we were last year," Bell says. The source of Bell's optimism: The Steelers told him after the season that they wanted to avoid a repeat of 2017 and actually lock him up this time. Feb. 28, 2018: General manager Kevin Colbert addresses Bell's status from the NFL scouting combine. He, too, sounds encouraged. "I don't like to get into too much detail," he says. "I can say this, though, I'm optimistic that we can find common ground. Those things are never final until they're final." Colbert stresses it's "nobody's goal" to use the tag. Until the tag became a reality. March 6, 2018: The Steelers tag Bell on the last day of the exclusive window. The tag is worth $14.5 million. Bell talks to ESPN about the news. "We're not coming to a number we both agree on -- they are too low, or I guess they feel I'm too high," Bell says. "I'm playing for strictly my value to the team. That's what I'm asking." The Steelers had come up from the previous year's deal that averaged $13.3 million per year, but it wasn't enough. He doubles down on his retire-or-sit-out approach. "I just have to decide if I'm going to play when the time comes," Bell says. March 29, 2018: Bell posts a cryptic tweet about how fans and media depict his approach to his contract. "It's so hard to be a hero in a city that paints youu out to be the villain," he tweets. Bell had spoken in the past about fans taking the team's side over the player's, so this tweet addresses his feelings on the issue. May 24, 2018: The Steelers undergo their second consecutive organized team activities without Bell. Players say they are torn. They want Bell to get paid but want a valued teammate with them, too. Antonio Brown supports Brown but, based on his own experience with contracts, adds, "the first rule of getting better is showing up. You can't make anything better without showing up." Brown later clarifies that he wasn't telling Bell he should show up, simply relaying his personal belief. So they put me on the tag, all right/Definitely not going to trip like I that bad guy/Wonder why they treat me like the bad guy/You say I ain't the best, but that's a bad lie/I'mma do what I want, just leave me alone/If I don't do what you want then you want me gone/I'mma say you being real aggressive/The way you switch up on me real impressive. July 16, 2018: The Steelers and Bell once again fail to reach a deal by the 4 p.m. ET deadline, forcing Bell to play -- or not play -- on a $14.5 million tag. Agent Adisa Bakari tells Schefter that Bell likely enters his final season as a Steeler. NFL Network reports that Bell's final offer was $70 million over five years. Bell tweets to fans that he was sorry they were let down, both sides tried hard to execute a deal and 2018 would be his "best [season] to date." July 17, 2018: Appearing on NFL Live, Bakari stresses that guaranteed money was a sticking point. "The Steelers have a unique way of structuring deals," Bakari says. "These contracts are not fully guaranteed. Le'Veon plays a position that has one of the shortest lifespans in the league. We have to focus on the guarantee. It’s safe to say he’ll get a guarantee [as a free agent] that is more traditional, and he’ll be protected for the balance of his career." This quote encapsulates why both sides are where they are now. Another team might kick in more guarantees to get the deal done, but the Steelers simply don't do that. Bakari tells SiriusXM that, barring something "exceptional," Bell will follow the same blueprint as the previous year: miss training camp, show up for Week 1. July 25, 2018: Los Angeles Rams running back Todd Gurley signs a four-year, $57.5 million extension. The deal includes his fifth-year option and averages around $11.5 million per year with that season in account. Gurley got $21.95 million at signing, according to reports. Aug. 23, 2018: Steelers players are still in the dark about Bell's return. "I wish I knew," center Maurkice Pouncey says. Aug. 28, 2018: Bell responds to a report that he indicated to teammates he was coming Week 1, calling it "fake news." "I never said anything to no one," he tweets. Sept. 3, 2018: On Monday, Pouncey tells ESPN that Bell will show up Wednesday. Pouncey says he wasn't told that directly but was going off a feeling, based on the competitor that Pouncey knows well. Sept. 8, 2018: Not showing by the Saturday before the season opener means Bell misses out on his first $855,000 game check off the franchise tag. Sept. 9, 2018: Conner, Bell's replacement, goes for 192 total yards in his first NFL start, setting the stage for a successful stint replacing Bell, save for a dormant three-game stretch from Weeks 2-4. Conner is among the league leaders in rushing yards and touchdowns. Sept. 17, 2018: Bell is spotted on a jet ski in South Florida, via TMZ. He tells a fan who captured him on video that he's "cooling" on the water. Bell has a release party for his EP, "My Side of Things," in a Miami club around the same time. Oct. 1, 2018: Bell speaks publicly about his holdout for the first time in an interview with ESPN. Bell says he's playing in 2018, doesn't expect to be traded, expects the team to transition-tag him in 2019 and still wants to be a Steeler long term. "I miss football," Bell says. "When I do get back, I plan to give it my all. I still do want to go out there and win a Super Bowl with the Steelers." Bell adds he had to "take this stand" and confirms he turned down a $70 million offer over five years because of the low guarantee ($17 million). "It's monopoly money," he says. Oct. 22, 2018: Bell doesn't show up for the Monday of Week 8 despite original plans to do so, but around this time the Steelers have their first contact with Bakari in a while. Oct. 30, 2018: The trade deadline passes, ensuring Bell cannot be dealt because he's an unsigned player. Nov. 6, 2018: A day after he tweets "Fairwell Miami," Bell is spotted playing basketball at the LA Fitness gym in a north Pittsburgh suburb. The story is officially the gift that keeps on giving. Nov. 7, 2018: Bell's latest cryptic, upside-down tweet six days before the deadline hints that he might not be showing up at all. Nov. 8, 2018: After pounding the Panthers 52-21 behind his five touchdowns, Roethlisberger tells the media he won't comment on players who aren't here. He is asked directly about Bell. Tight end Jesse James says Bell can help the offense because he's an explosive player. Nov. 10, 2018: Bell is unlikely to report to the Steelers by the Nov. 13 deadline, according to Schefter, citing Bell's "cone of silence" in recent weeks in regard to communication with the team or the media. The countdown is on. Nov. 13, 2018: The 4 p.m. ET deadline passes with no Bell. He is now ineligible to play the remainder of the 2018 season. He will become a free agent this offseason.